Armand C. Pirvu, 51, passed away January 23, 2019. Funeral services will be 10AM, Tuesday, January 29, 2019 at Annunciation Greek Orthodox Church, 12001 Wornall Rd., Kansas City, MO; burial in Pleasant Valley Cemetery, 9501 W. 159th St, Overland Park, KS. Armand was born to the late Constantin and Jeana on December 3, 1967 in Bucharest Romania. 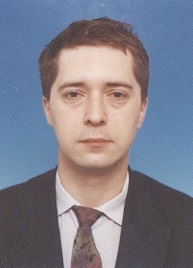 He graduated in 1992 with a Master in Engineering from University of Bucharest, Romania. He married Daniela on September 9, 1989 in Bucharest, Romania and we were married for 29 years, former high school sweethearts. He worked as database administrator at On Deck in New Work City. Armand was a lovely husband, he enjoyed life, he was incredible smart, kind, talented photographer. He had a good sense of humor and he was a very productive man working until the end of his life. Armand was a family man. He liked spending time with his family and he adored his son. He was a loving and caring person, devoted husband, father and friend, always thinking about others rather than him. Armand is survived by his wife Daniela and his son Antonio. Armand's hobby were photography and traveling and he made many friends throughout his passion. Funeral services will be 10AM, Tuesday, January 29, 2019 at Annunciation Greek Orthodox Church, 12001 Wornall Rd., Kansas City, MO; burial in Pleasant Valley Cemetery, 9501 W. 159th St, Overland Park, KS. So sorry for your loss Daniela. Prayers and hugs to you and your family. My deepest regrets for this loss. It has deeply affected so many of us. I was fortunate and honored to call him my friend. Words fail at a time like this. Armand will be so missed. Armand was a brilliant computer database analyst He was a loyal and trusted friend and I will miss him greatly. He would always go out of his way to help a friend in need. Rest in peace my friend I will miss our phone conversations! He was a good man especially since his cancer. Armand was an outstanding neighbor to us. Whenever he heard that we were having computer problems, he was the first to jump in and help us. When our daughter's computer crashed, causing her to lose all of her wedding pictures, Armand spent over thirty hours working on it until he was eventually able to retrieve all those photos. He was absolutely devoted to his wife Daniela, their son Antonio and their two rescue dogs. Our neighborhood has a big void with his loss. He is deeply missed. May God take you in his arms and shine his everlasting light on your family. I never personally met Armand but got to know him via his tech support role with, I believe, Computer Associates. He was always the go-to guy when there were Ingres issues - always professional and personable. I talked with him a number of times after he got sick. He was the kind of a guy who demanded your attention. He was one-of-kind. I don’t usually get to know vendors like I did Armand. I will miss his impassioned opinions. Condolences to his family. You're in our thoughts and prayers. We admired Armand's work ethic and strength. Stay strong Daniela and Antonio. You both have so many good memories to cherish. Daniela and Antonio, I am so saddened to hear that Armand has passed. He was a good friend and will be sorely missed by many. You will be in my prayers and may God give you peace and strength in the days ahead. Armand’s passion for his family, work, and friends was unmatched. He will be greatly missed. Rest In Peace Bud. Oh Daniela! So very sorry Armand has died. Through your stories, the two of you have led a remarkable life and your love and taking care of each other shone. May he rest in peace. Your memories and Antonio's will keep him close. Peace my friend. Armand you were a great friend and colleague. Thanks buddy. Daniela and Antonio, we are terribly sorry for your loss. Armand will be missed, he was a great husband, father and friend, who touched so many lives. He had a full life and was passionate about so many things, you have wonderful memories to cherish. Rest in peace our friend, and Daniela and Antonio we will keep you in our prayers and thoughts. Daniela, we are deeply saddened by the loss of your beloved Armand. May God bless and comfort you and your family during this difficult period, please accept our sincere condolences. Daniela, I worked with Armand at CA. May God provide you and Antonio with strength and love as you both travel on this path ahead. - Jim "With the saints give rest, O Christ our God, to the soul of Your servant, Armand, where is neither sickness, nor sorrow, nor sighing, but life everlasting …"
Daniela, I know your family has gone through great struggles with Armand's illness and I hope you can find comfort that he is now at peace. Wishing you healing in this time of great sadness. Daniela, I’m so sorry for your loss. My thoughts and prayers will continue during this difficult time. Cherish the memories until you two meet again. May you feel Gods comfort during this difficult time. Love you friend. Daniela and Antonio, no words can express how much I miss Armand ! I consider all of you as part of my family! We spent many good times together! I love you now and I always will! God bless you and comfort you and make his light to shine upon you! Daniela, Antonio, please accept my deepest condolences for your loss! In all the years I have known him, I’ve never imagined the day would come for me to write these words! And yet, that day came much, much too soon! Armand was not afraid to live and he was not afraid to die! He loved living, he cared deeply for his family and friends, and he fought incredibly until the very end. His great spirit will endure in us, the ones he left behind with too much haste. Rest in peace my dear friend, you will always be with us! Daniela and Antonio, I am sad to lose my dear friend, Armand! I always looked forward to being with your family! Armand was a light in the life of everyone who knew him! I will always have wonderful memories of Armand! I love you and Antonio with all my heart! Armand was an exceptional man with a heart of gold. His honesty, and genuine, passionate attitude towards life in everything he does is something that will forever define his memory. I’ve had a pleasure of working with Armand and being his friend since 2004. We’ve been through many difficult situations and I always knew I could rely on Armand’s professionalism and total dedication to our task. He was someone I could count on to help me, listen to me and advise me on professional and personal matters at any time of day or night. His brilliant mind offered plethora of unique solutions and ideas that only he could come up with! Over the years, our bonds grew stronger and he became more like a brother to me. His personable style and huge, welcoming heart made it easy to embrace and love him with every fiber of my being. Despite his illness, he was always concerned more for others, and his cheerful greetings will forever ring in my ears! His selfless giving profoundly touched me; Armand’s influence permeated every sphere of my life and without him I would never be the same. He enriched my life in so many ways and I will forever be grateful to him. I like to think of him now like a bird that is finally free, released from physical pain and suffering. Without a shadow of a doubt, I know that he will never stop looking after us and helping in his own way. Fly freely my friend, love has no end and separation is only an illusion of our mind. You are just one thought away. Until we meet again. Daniela we still are deeply saddened that Armand has passed, what today looks terrible, but tomorrow will bring the peace, prayers and hugs to you and your family. Feel like not real. You always ahead of us. It is my honor to know Armand. Things just goes too fast, and Armand always is ahead of games. He will be missed greatly, what he has done is no one can replace. Farewell my friend, see you up there.